Ask Amanda: What does wyif mean? Some knitting abbreviations seem pretty straightforward, like how K stands for “knit” and P stands for “purl,” but when multiple letters get involved, sometimes things get murky. Some of the leading offenders? Knitting terms like wyif and its equally sneaky cousin, wyib. To make matters worse, even after a knitter has deciphered what these terms stand for, putting them into practice can be confusing. We are here to help! At their most basic level, both of these terms are actually pretty easy to decipher – all they really refer to is the position of your working yarn in relation to your knitting. When you’re getting ready to work a purl stitch, you make sure that you’re holding the yarn in front, and when you’re going to knit a stitch, you make sure that the yarn is being held to the back. With these instructions, you’re being directed to put your yarn in front (as if to knit) or back (as if to purl), but you’re not necessarily going to be working a knit or purl stitch at that point. It only refers to the position of the yarn, not the next action. What often leads to confusion is what happens in your pattern directly before or after you’re asked to move your yarn to the front or back. 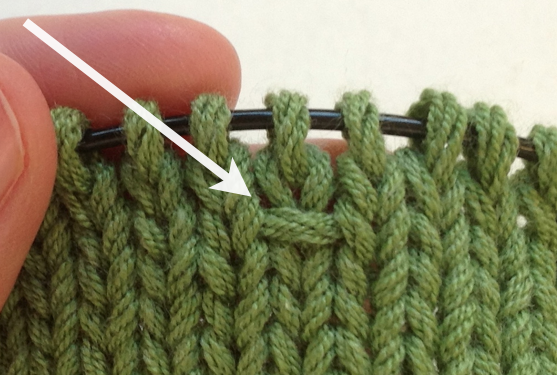 In our patterns, we often pair wyif with slipped stitches, which is often abbreviated along the lines of “slip wyif.” With a direction like this, you would hold the yarn to the front of the work and slip the next stitch (see my post about slipped stitches for a refresher). The result would be a slipped stitch with the yarn strand running across the front of it (see below), which can be a nice decorative element or part of a fancy pattern stitch. That stitch pattern uses a combination of stitches slipped both wyif and wyib, alternated with normal knit and purl stitches. The result is an interesting textured stripe that almost resembles embroidery. It’s a perfect project for practicing your wyif and wyib skills! I”m get confused when the purl side is facing me. Does the f mean the right side of the work and b, the back of the work. Or does f mean any side that is facing me and b mean any work means back if it is facing away from me. In which case in some patterns the purl side is facing me when the pattern says WYIF . (I’m knitting a pattern stitch called netted pattern)..
Also the pattern tells me to leave the yarn in front on the pearl row. That is confusing! WYIF means that no matter what side is facing you, you are slipping a stitch with your yarn facing you. WYIB means that no matter what side is facing you, you are slipping a stitch with the yarn on the opposite side of you. I am making the Kita pattern with Borocco Folio. The pattern says to slip 3 stitches with yarn in front, then to kinit 1 and purl to the end. My question is, how can I have the yarn in front and then make a knit stitch? It doesn’t look right. Please contact patternsupport@berroco.com for help with specific questions. Thank you for your help with this Wyif – with yarn in front. I always forget which way the working yarn goes. Thank you so much for your info! Sure made the project much easier and enjoyable to tackle..
some yarn, started knitting again. I noticed I still had the passion I used to have for knitting. Now, at 91 I started knitting again but forgot most of the abbreviations that knitters usually use. The Internet and your blog saved me and I found what I was looking for. WYIF and WYIB. I can start knitting my cowl now and surprise one of my great granddaughters with it. Nana Willy in San Jose, California. Hello Nana Willy! Good for you for picking the needles back up! It’s always great to come back to a hobby you love. I’m so glad we could help you get back into the swing of things! I have encountered a pattern that calls for slipping 4 stitches wyib. Is this merely a decorative detail? It seems silly and making the shawl difficult. I am concerned there might be a pucker if I pulled too tightly. As well, there should be no concern for gauge as it is going to be a scarf. What is your opinion? Hi Christine! There could be any number of reasons for this—can you tell me the name of the pattern so I can try to give you a complete answer? Without knowing what the pattern is or what exactly it’s asking you to do, you would really just bring the yarn in front, or the yarn in back, of the work and then do the next stitch. For example, if it’s saying Wyif, slip first stitch, then purl, you’re creating a slipped-stitch selvedge (which can be decorative, or make it easier to pick up stitches for another part of the piece), then the yarn is already in front to purl the next stitch. I’m in desperate need of help for a pattern I’m working on (Viola’s Coat, Interweave). The pattern will say sl1 wyb, no stitch, sl1 wyb–which, means the yarn is already in back when I do the second sl1 wyb. Do I need to do a yarn over when this happens–as in move it in back again? Or just leave the yarn where it is (in the back) and slip the stitch? Without being able to see the pattern (since it’s not one of ours), I can’t be 100% sure, but I wouldn’t work a yarnover—that will increase a stitch when you probably don’t want to. I’m not sure why there would be a no stitch in between but again, I can’t see the pattern so maybe it makes sense in context. I would just keep the yarn in the back and slip two stitches.